Doreen Griffin’s Baby Boy and Teddy Bear Model Cake Topper made on Sugar and Crumbs Facebook Live 18th March 2019. 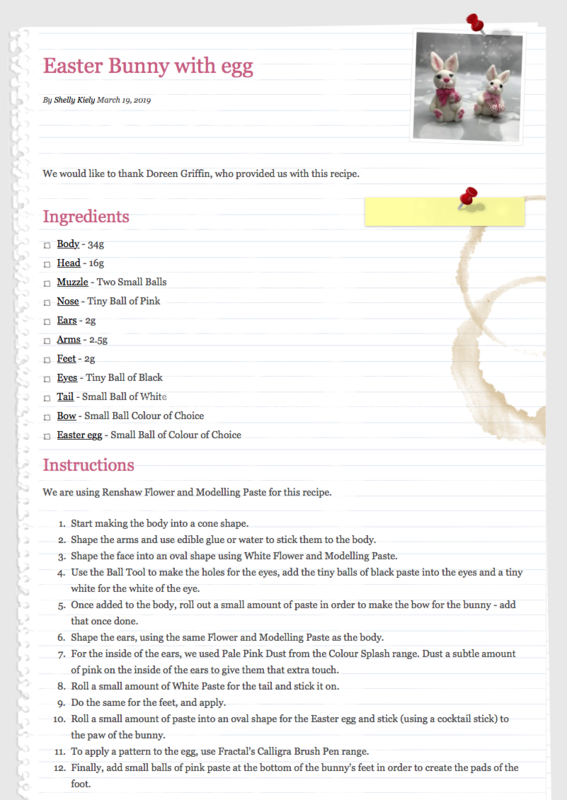 We would like to thank Doreen Griffin for her recipe. Baby Bear and Teddy Bear Model. 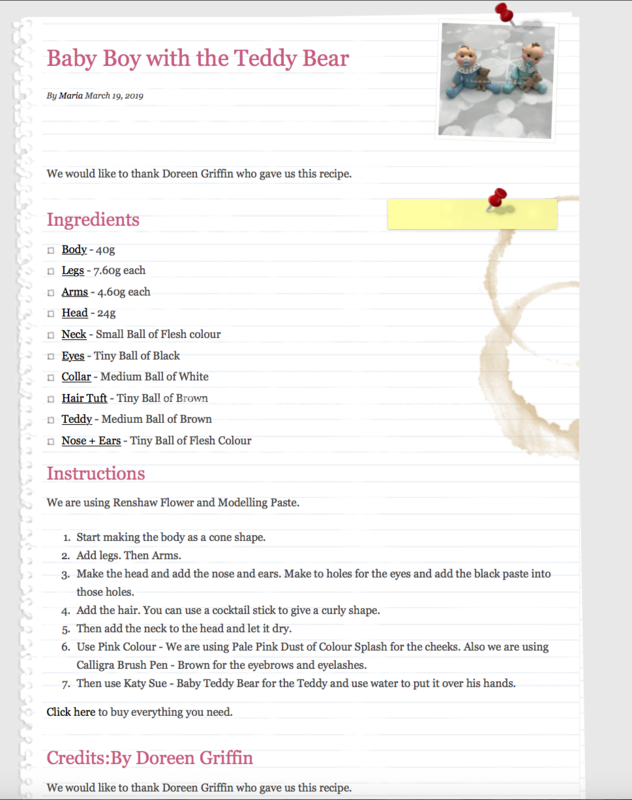 We are using flesh, blue, black, white, pink and brown (or use colours of your choice) Renshaw Flower and Modelling Paste. 1. Start making the body as a cone shape. 2. Add legs and arms. 3. Make the head and add the nose and ears. Make two holes for the eyes and add the black paste into those holes. 4. Add the hair. You can use a cocktail stick to give a curly shape. 5. Then add the neck to the head and let it dry. 6. Use pink Colour - We are using Pale Pink Dust of Colour Splash for the cheeks. Also we are using Calligra Brush Pen - brown for the eyebrows and eyelashes. 7. Then use Katy Sue - Baby Teddy Bear for the Teddy and use water to put it over his hands. Click here to buy everything you need. Here is the link to the YouTube video on how to make the Baby Boy and Teddy Bear Cake Topper. https://youtu.be/hhzrrE2ZU4M. 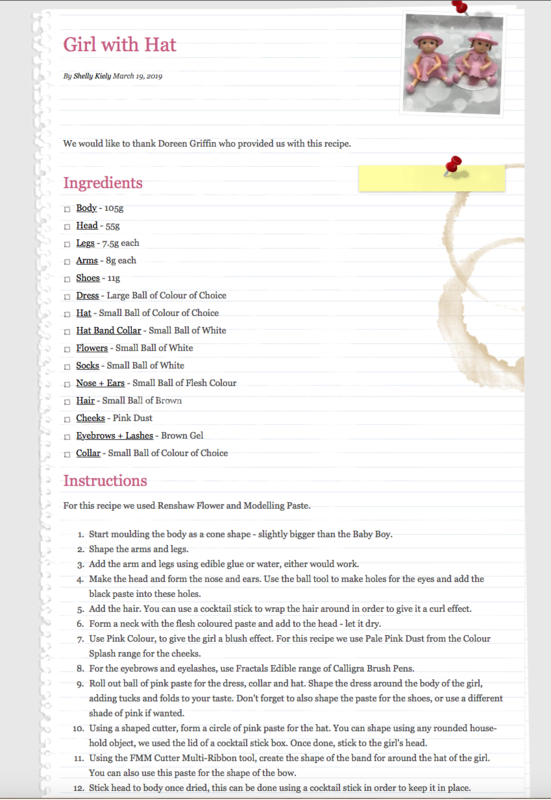 We would like to thank Doreen Griffin who gave us this recipe.